At Aiken Well Drilling, we are your full service experts in well drilling. With nearly 45 years of experience, our contractors bring the knowledge and skill to handle any type of water well drilling project. If you’re looking for an experienced drilling contractor in Deschutes County, OR, call a name you can trust, Aiken Well Drilling. Since 1970, our experts have been providing well drilling services to both residential and commercial customers. Specializing in drilling exclusively, we are able to perform an array of services, including drilling domestic wells, geothermal wells and providing well maintenance service, such as well casing, well clean outs, well deepening, well alterations, abandoned well sealing and more. When you need water located or water well work performed, we’re the drilling contractors in Deschutes County, OR, to call on for dependable service. We perform high quality drilling. We deliver quick and accurate results using the latest technological advancements. We are members of both the Oregon and Nation Ground Water Associations. 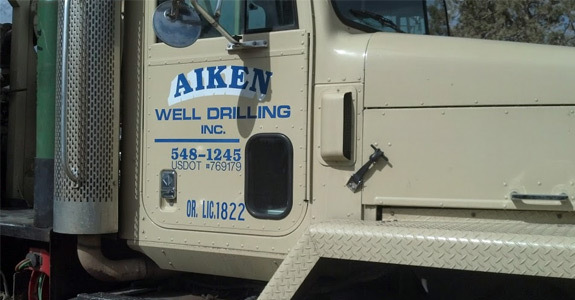 For quality drilling, there is no better name in the business than Aiken Well Drilling.